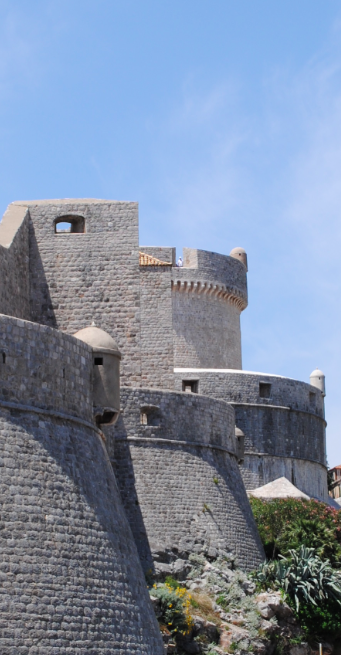 One of the most beautiful and strongest fort systems in the Mediterranean, the intact city walls encircle the historic city of Dubrovnik for 1940 metres. 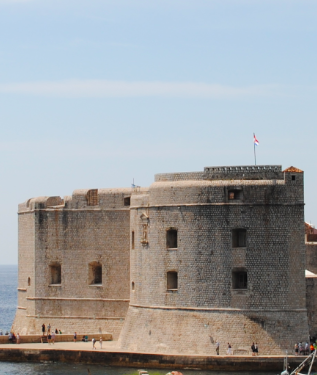 The walls consist of a series of forts, bastions, casemates, towers and detached forts. Although construction of the first fort started in the 8th century, the walls were mostly built during the 15th and 16th centuries. 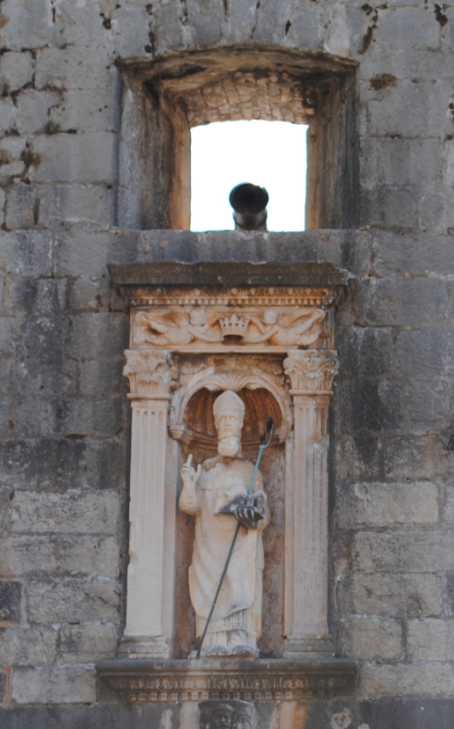 The historical figure of Sv Vlaho (St Blaise) set in the walls over the main entrance into town. Pile Gate is approached over a wooden drawbridge on chains. The gate was constructed in 1537 with a Renaissance arch with the protector of the city (St Blaise) displayed in a richly decorated niche. The main entrance (Pile Gate) leads onto the Old City’s main thoroughfare – Placa Stradun. The Placa is the main promenade and gathering place popular for feasts and processions. Within the city walls lies the Arsenal in the Old Port. The three symmetrical vaults would be sealed by brick during the time of the Republic to avoid detection of the ship building which took place inside. 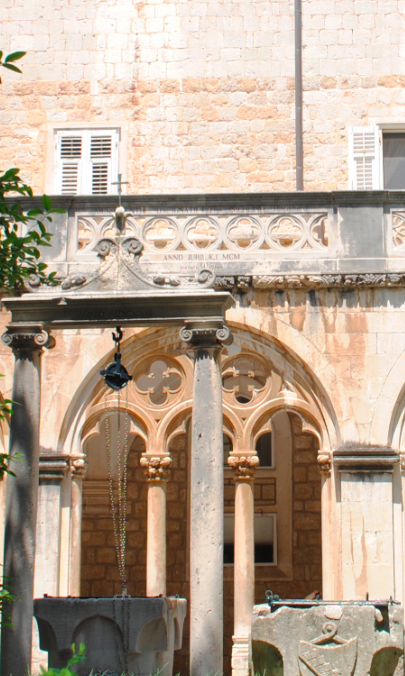 In the east part of the city and close to the walls is the large architectural complex of the Dominican monastery. 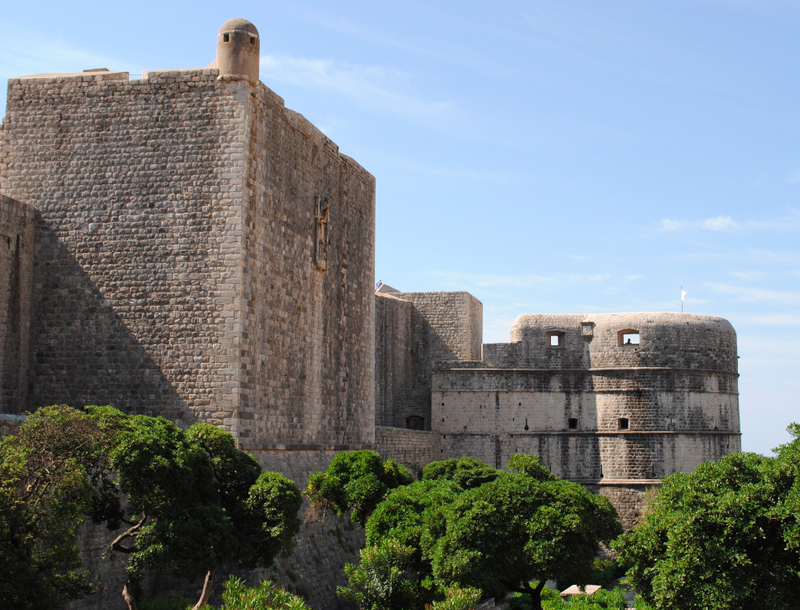 It is a major treasury of cultural and art heritage in Dubrovnik. In its library are numerous illuminated manuscripts and a rich archive with precious documents. The monastery and church buildings were completed in the 14th century although the Dominicans established their monastery in 1225. 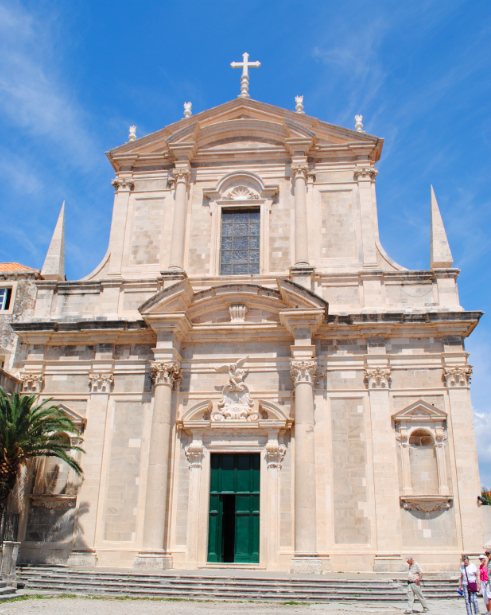 The church is one of the largest Gothic buildings on the east Adriatic coast. Of a simple architectural design featuring a hall with a pentagonal Gothic apse which is separated from the central area by three high openings with Gothic arches. The Monastery complex acquired its final shape in the 15th century when the vestry, the chapter house and the cloister were added. 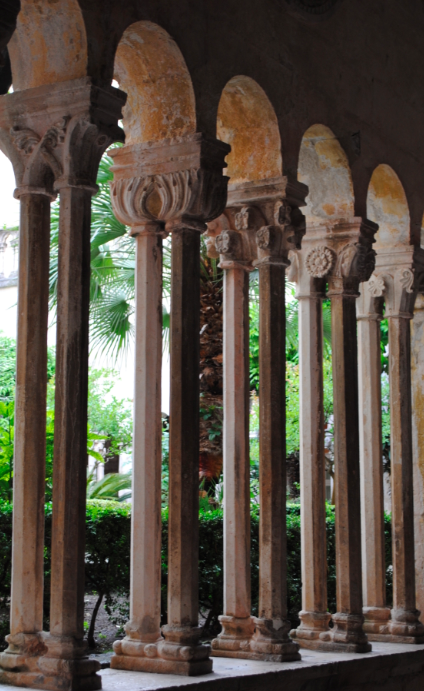 The beautiful porches of the cloister were built between 1456 and 1483 by local builders. The arches of the cloister are closed by Gothic and Renaissance triforas. In the middle of the courtyard is a richly decorated cistern crown. The interior is rich in stone church furniture, a pulpit , gravestones and Renaissance niches. The large complex of the Franciscan monastery (Friars Minor) is located at the very beginning of the Placa and to the left of the Pile Gate. Spreading north along the walls as far as the tower Minceta, the lateral facade of the monastery church runs along the principle street of Dubrovnik. 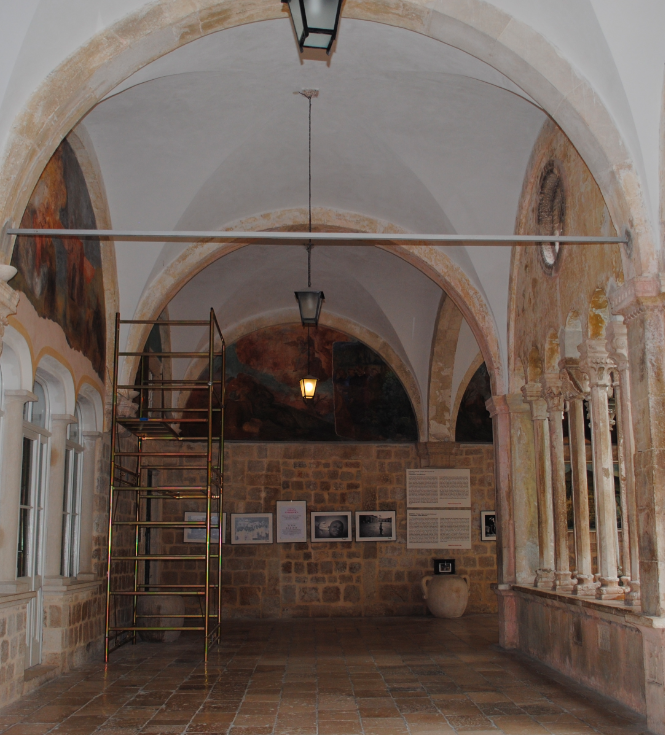 The monastery building was started in 1317. Some parts were destroyed and rebuilt several times. 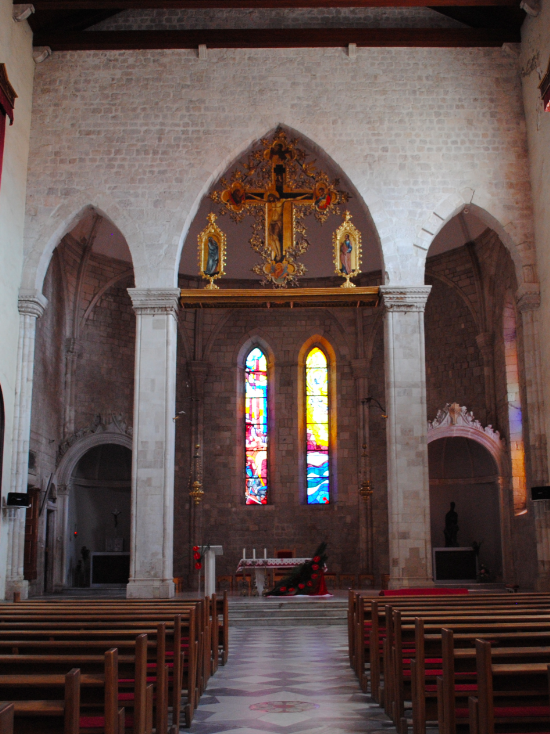 The large Franciscan church which was one of the richest in Dubrovnik at the time, was destroyed in the 1667 earthquake. The portal on the south wall is the only element of the former building which has been preserved. The portal is believed to have been moved from the front to the lateral wall during the course of the 17th century restoration. 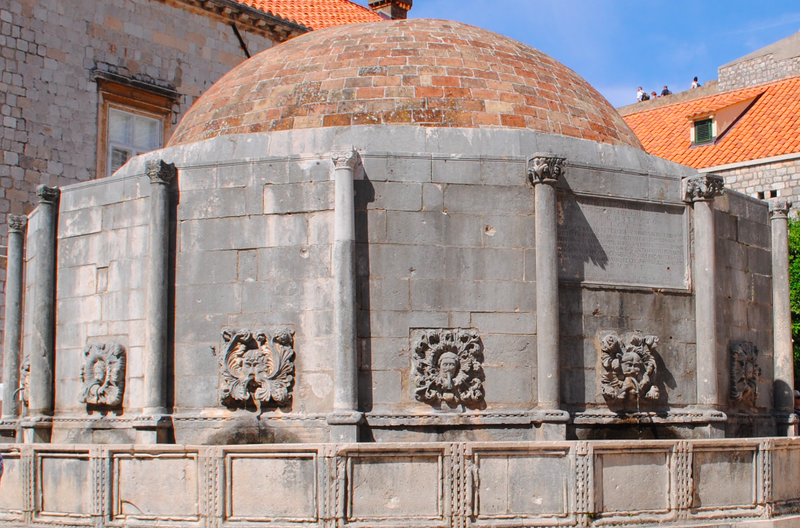 It was the most monumental portal in Dubrovnik, according to the contract of 1498, and was carved in the local workshop owned by the brothers Leonard and Petar Petrovic. 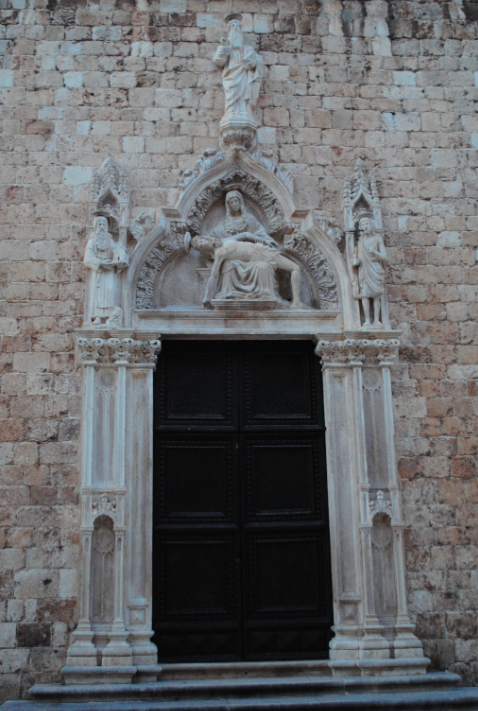 The figures of St.Jerome and St.John the Baptist are set above the door-posts with the Pietr in relief is represented in the central Gothic lunette. Above the lunette is the figure of the Father Creator. The cloister was built by master Mihoje Brajkov of Bar in 1360. Framed by a colonnade of double hexaphoras with each having a completely different capital. 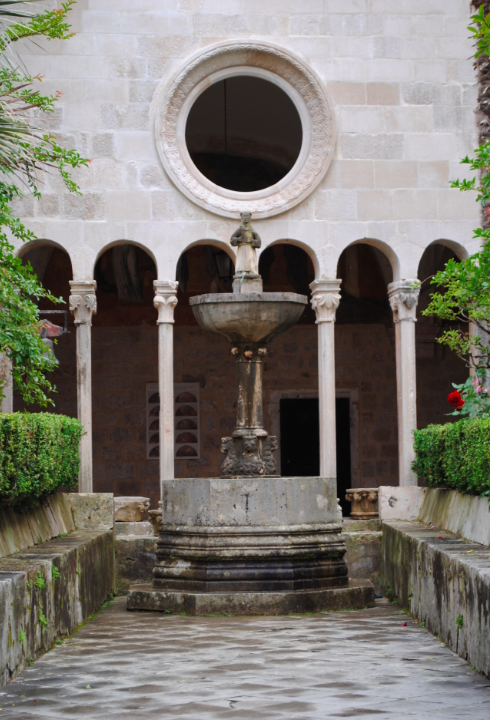 The Franciscan cloister is of late Romanesque design and considered one of the most valuable creations on the Croatian shores of the Adriatic. 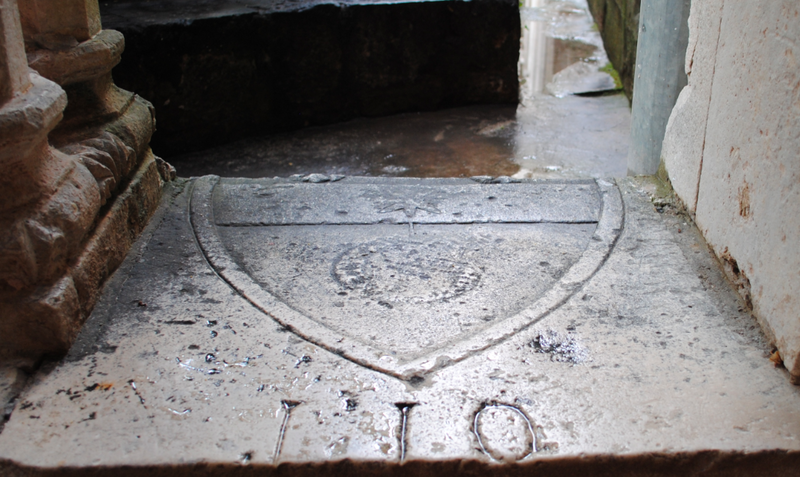 In 1317 a pharmacy was founded in the monastery, the third oldest in the world and continues to function today. 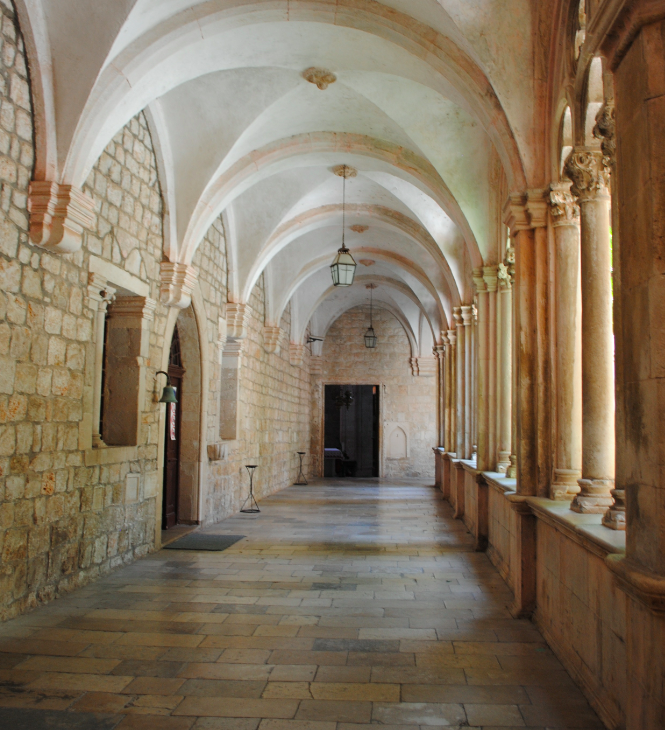 The monastery owns one of the richest libraries in Croatia, famous all over the world for its inventory. The collection has over 20,000 books, over 1200 of which are old manuscripts and 7 books of old church corals. Placa is derived from the Greek and Latin Platea which we translate as “street”. 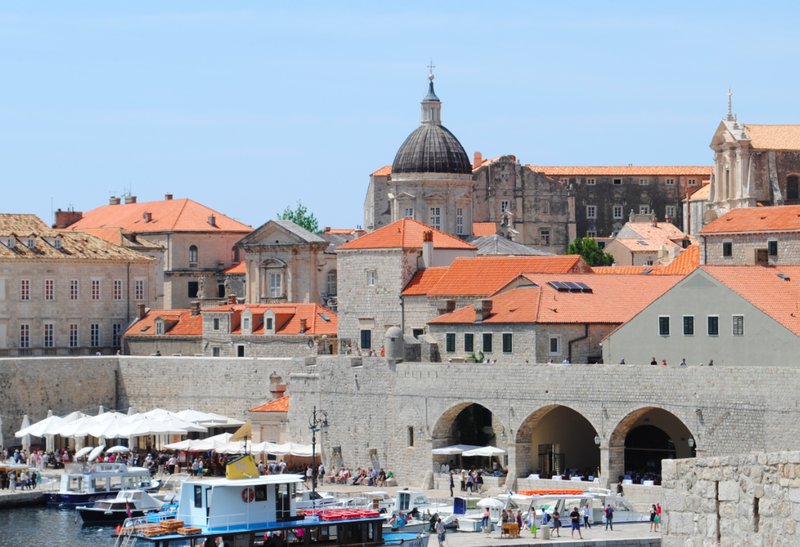 The present shape of the Placa was as a result of the earthquake of 1667 when Dubrovnik was rebuilt hastily after destruction and fires. The unified construction of two rows of stone houses, of equal height with similar fronts and similar interior arrangement, and built in the Baroque style now form the appearance of the Placa. The Senate of the Republic ruled that every house should have space for several shops on the ground floor. 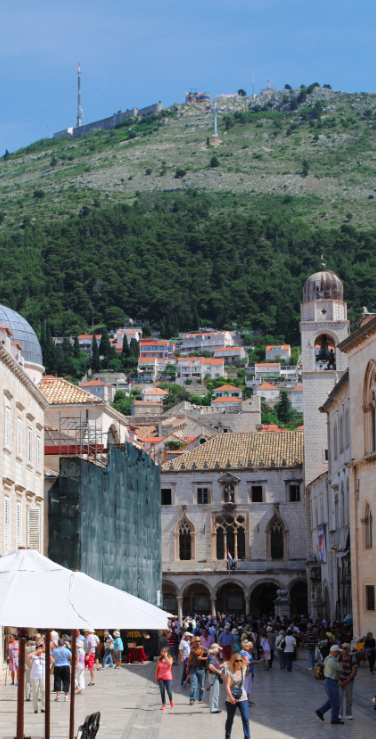 Placa is the main open urban area in Dubrovnik and favoured as a gathering place and promenade. It is the main business street of the old city centre and popular with processions and feasts. The street divides the old city into northern and southern halves and is the shortest route between the western and eastern gates. It was created at the end of the 11th century. In the western end of the Placa, close to the Pile Gate, the street widens into Paskoja Milicevica Square where the Franciscan Monastery is located. At the opposite, eastern end the Placa widens into Luza square. This square was formerly used as a market place. A great number of important administrative and sacral buildings are situated around the square such as the Baroque church of St Blasius, the patron saint of Dubrovnik, Little Onofrio’s Fountain, Sponza Palace and the Mint. 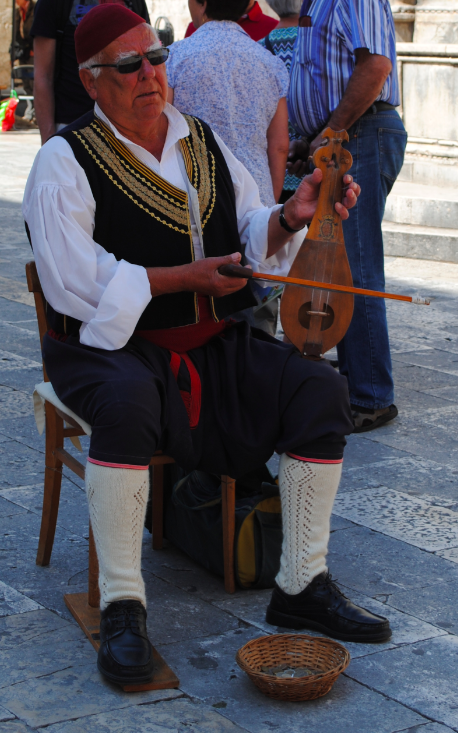 The main festivities take place on Luza square including the feast of St Blasius and the opening ceremony of the summer festival. 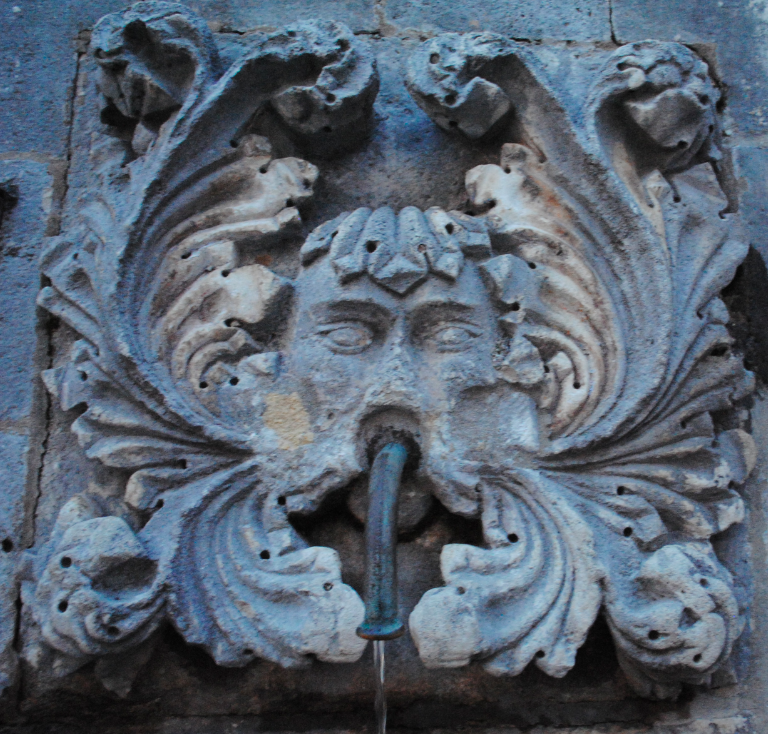 By building the Little Onofrio Fountain and the Big Onofrio Fountain, water was supplied to the city in two public places. The fountain was heavily damaged by the earthquake of 1667 and as a result, the sculptural ornaments which once adorned the Fountain, have been lost. 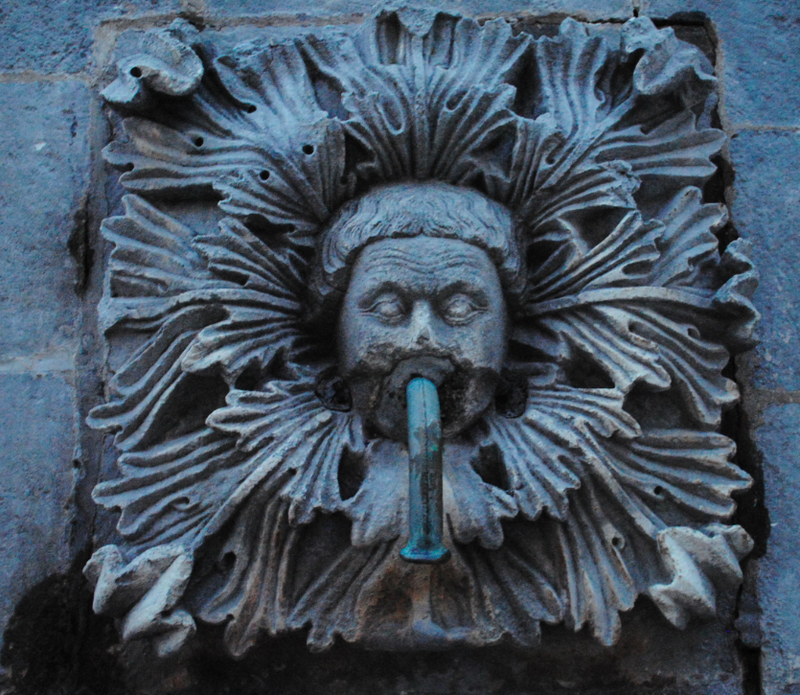 The original 16 masks in relief are still extant and water jets gush out of their mouths.